Find out how the new top of the range 12fps shooting, 4K video recording Panasonic Lumix GH4 performs in our full review. The new Panasonic Lumix GH4 is the latest, top of the range Micro Four Thirds camera from Panasonic, and features 4K video recording as well as shooting stills at 12fps, faster than any other Micro Four Thirds camera. 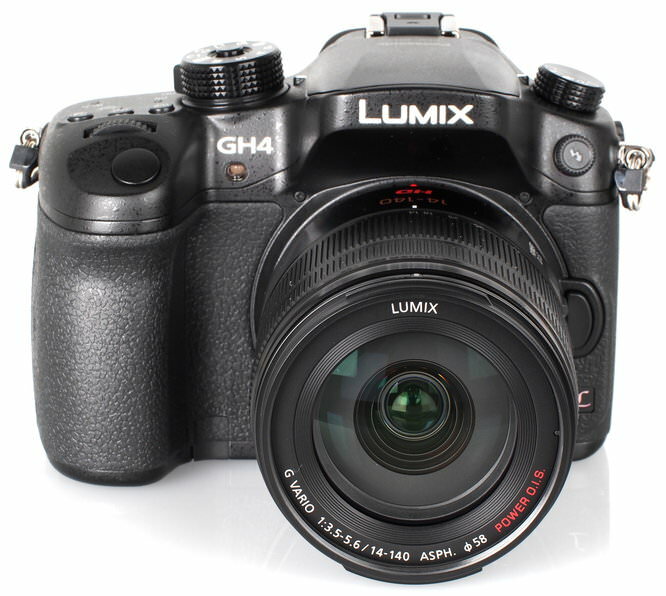 The Panasonic Lumix GH4 updates the GH3, and while the camera body design appears very similar, the GH4 is a significantly updated camera underneath. Nb. 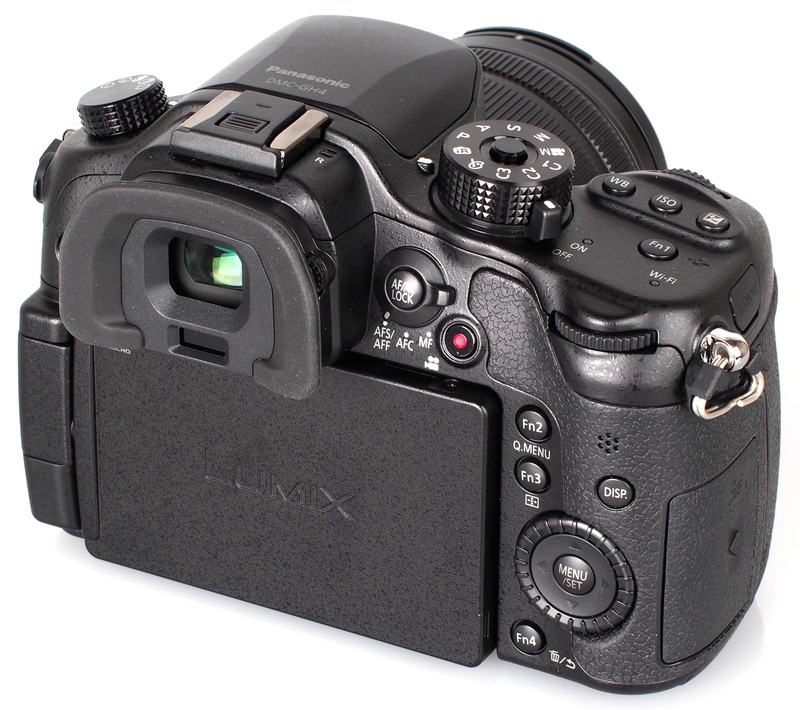 The Panasonic Lumix GH4R is an updated version of the GH4, with unlimited video recording. At the heart of the Panasonic Lumix GH4 is a new 16 megapixel Micro Four Thirds sensor, along with a new image processor, enabling 12fps continuous shooting, as well as ultra high-resolution 4K video recording. To protect the camera, the GH4 features a magnesium alloy body, which is weather-sealed to make it splash and dust proof. The new high speed shutter unit is rated as having a 200,000 shutter release life. The Panasonic Lumix GH4 has a large rubber eye-piece with eye-detection, and the electronic viewfinder is a high resolution unit with 2360k dots. Burst shooting at 12fps will record 40 RAW images and upto 100 JPEG images. 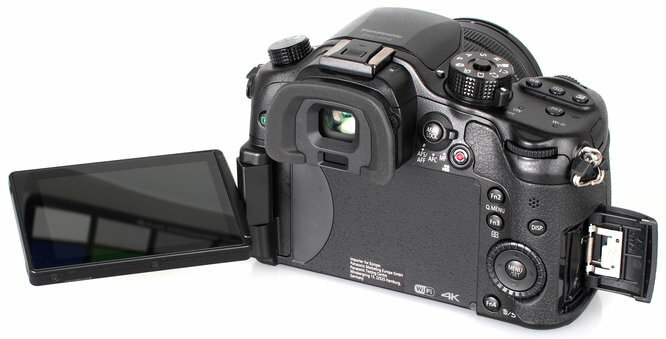 There is side access to the memory card slot where the camera will take SD/SDHC and SDXC memory cards. Built in Wi-Fi and NFC makes it possible to remotely control the camera from a compatible Android or iOS device, as well as instantly share images. The back of the camera features a vari-angle 3inch touch screen with a 1036k dot resolution. On the side is a microphone and headphone socket, ideal for those interested in high audio quality video recording. 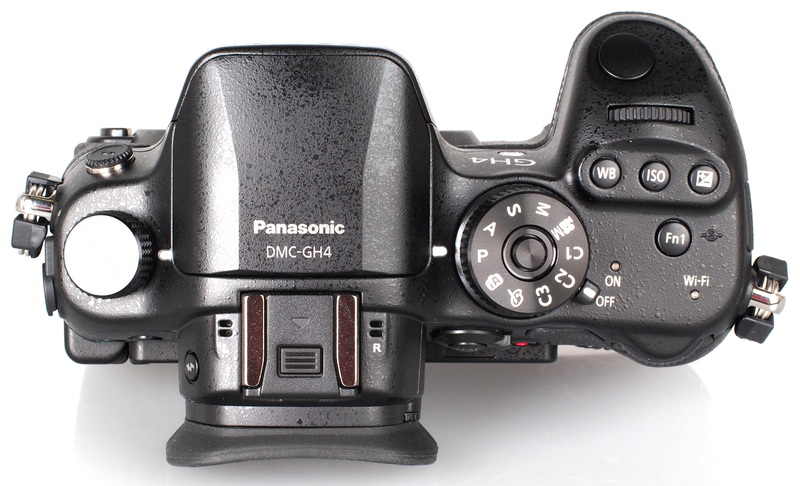 The GH4 offers improved focus speeds thanks to enhanced DFD (Depth from defocus) technology. This uses lens data built into the camera to calculate the quickest focus speeds, and promises ultra fast focus speeds of just 0.07 seconds. In addition the camera offers 7.5fps continuous shooting with continuous AF. Handling - Like the GH3, the GH4 feels like a mini Digital SLR, rather than a "mirrorless" camera, and the weather sealed magnesium body gives the camera a solid reassuring feel. This makes it suitable for shooting in nearly all weather conditions, and the more compact size of the system (including lenses) will make this easier to carry around with you compared to a weather sealed Digital SLR. The camera controls are neatly designed with the WB / ISO / EV buttons just behind the shutter release, making it easy to change these settings. The front and back control wheels make changing settings quick and easy. The large scroll wheel at the back that surrounds the Menu / OK button is click free which means you can silently change settings when recording video. The body of the camera features 5 function buttons, as well as a further 5 function buttons that can be customised on the touch-screen, giving a total of 10 customisable function buttons. The top now features a chunkier mode dial that can be locked and unlocked with a middle button. There is also a time-lapse drive mode on the drive mode dial on the top left. The hand grip has been improved with additional purchase for the tips of your fingers, and with a larger rubber eye-piece surrounding the electronic viewfinder, the camera should be more comfortable to use for those that wear glasses (as well as for those that don't). 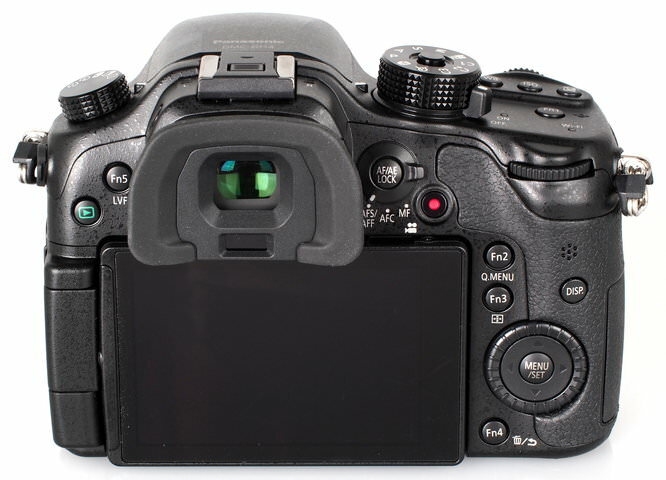 The OLED electronic viewfinder (EVF) features a very good refresh rate, and the display is smooth when panning. Colour reproduction is good and the colour of the EVF matches the screen. The camera features a 49 area focus system covering the whole frame. There are a number of auto-focus modes, including face / eye detection, AF tracking, multi-area, custom multi area, spot, and pin-point. Focus peaking and zebra pattern are new, and aid in manual focusing, making it easy to see what is and isn't in focus. The focus point can also be set using the touch screen making it quick and easy to set exactly what you want to be in focus. The screen brightness, contrast, saturation, blue tint, and red tint can all be adjusted, which will help when using the screen in bright conditions. The screen quality is very good, with a clear display making it easy to read text and symbols on the screen, and viewing angles are very good. 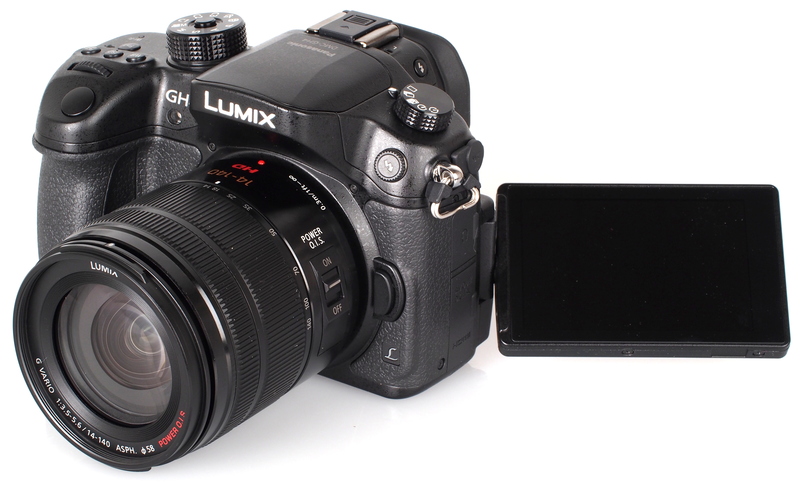 Menus – The Panasonic Lumix GH4 menus are clearly laid out into separate areas, including record, video, custom, setup and playback. With the touchscreen it's possible to control the menus as well as the control panel on the back of the screen, making it very easy to change settings if needed. There are a large number of external controls so a lot of the time you simply don't need to enter the menus. Built in help can be switched on and off to help guide you through the menu options - and with the large number of options it can be worth switching this on from time to time, while you familiarise yourself with the camera. 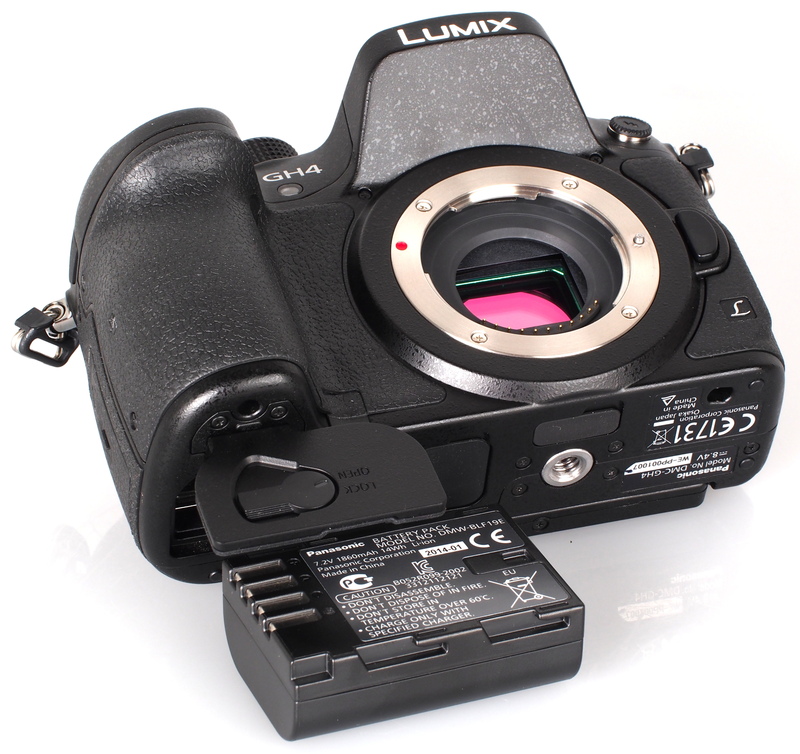 Battery life - Battery life is rated at 500 shots according to Panasonic / CIPA test results, which is very good for a DSLR-styled mirrorless camera. Battery life can be extended with the optional weather-sealed battery grip. The battery cover is lockable, providing extra protection to the battery so it's unlikely to accidentally fall out. Tested with the Panasonic 12-35mm f/2.8 lens. The camera is capable of shooting at 11.6fps for 90 shots when shooting JPEG Fine, and 10.2fps for 40 shots when shooting RAW images. We were able to shoot at between 5 and 6fps with continuous AF active. Shutter response, focus speeds, and shot to shot times are all excellent, with the camera having a quick switch on time. Sample Photos - Flash performance is good with very little to no red-eye visible in our flash photos, and skin tones are good, with good colour, without being overly saturated. The photo styles can be adjusted so that you can set the contrast, sharpness, noise reduction, saturation, and hue to your own personal preferences. Exposure is reliable with the camera delivering consistent results under a variety of shooting conditions. Lens Performance - The camera has built in chromatic aberration correction so purple fringing is very well controlled. Another option is shading compensation and this will automatically correct vignetting to remove dark corners. Macro performance is good with the 14-140mm lens, or alternatively a dedicated macro lens can provide excellent results as shown. The camera is available as a kit with the Panasonic 14-140mm f/3.5-5.6 lens, however for optimum results, we would recommend having a look at one of the prime lenses available. Images taken with the 12-35mm f/2.8, 35-100mm f/2.8, 45mm f/2.8 Macro. ISO Noise Performance - The standard ISO range is from ISO200 to ISO25600, with ISO100 being an extended "Low" option. Noise is low at ISO100, although dynamic range is reduced. Noise remains low at ISO200, although there is a slight increase in noise at ISO400. At ISO800 noise increases slightly although performance is still very good. Again noise increases at ISO1600, although this time, detail drops slightly. Noise increases again at ISO3200 and ISO6400, although detail remains reasonably good, and we'd be happy to use these settings. Noise performance is very good, although at the higher ISO setting of 12800, does not quite match the performance of the Olympus OM-D E-M10 (the latest Olympus Micro Four Thirds camera), and is similar in performance to the E-M1. The GH4 can not match the Fujifilm X-T1 which gives better detail and less noise at this ISO setting. Results at ISO25600 are noisy with low levels of detail, and the majority of mirrorless cameras mentioned here give fairly poor results. These images taken with the Panasonic 14-140mm f/3.5-5.6 lens. White Balance Performance - Auto White Balance (AWB) images taken under tungsten lighting are quite warm, and using the tungsten preset improves results slightly, although for best results manual white balance is recommended. AWB performs well under fluorescent lighting, which is good as there is no dedicated fluorescent preset. These images taken with the Panasonic 14-140mm f/3.5-5.6 lens. The camera has a number of features for expanding dynamic range recorded if needed, including iDynamic, as well as HDR that combines 3 shots at different exposures. You can also adjust the highlight / shadow curve, much like you would adjust the curves in Photoshop. Digital Filters - There are a large number of creative effects available, with the majority of these featuring further settings you can adjust to tailor the effect. The camera saves all the original raw files, which is great if you want to go back to the original photo if you don't like the effect applied. The camera includes a sunshine mode which lets you position an additional light source in the image as well as alter the size. Video - 4K video is recorded at 3840x2160, 25p (or 30p, and 24p when set to NTSC mode) and can be selected when recording with any file type, excluding AVCHD. When recording AVCHD, sound is recorded as Dolby Digital. Focus peaking and zebra pattern aids manual focusing, and ISO200 to ISO6400 can be manually selected. There are many more options including: AVCHD, MP4 (AAC), MP4 (LPCM), and MOV file types, as well as numerous quality options, including 200mbps, 100mbps, 50mbps, 28mbps, 24mbps, 20mbps, 17mbps, as well as full HD at 50p, 50i, and 25p, along with lower resolutions of 720p, and VGA. For a full list of video options, of which there are hundreds, have a look at the full Panasonic specifications. Further features and options available include: Clean HDMI out, VFR ((Variable Frame Rate) - lets you set the video frame rate from 2fps to 96fps or 4x speed, when recording Full HD video. Stop motion animation and time-lapse shots are also available. For those interested in broadcast quality connections, there is the optional Interface unit (DMW-YAGHE) which gives Cinema4K (4096x2160, 24p), TC IN (BNC), Audio In (XLR, Line, mine), SDI Out (BNC, embedded timecode), HDMI out and more. Full details can be found on the Panasonic website. A Full HD 1080p video example is shown below, recorded at 50p, 50mbps. 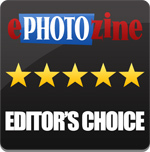 Other examples can be found on the ePHOTOzine YouTube channel including 1080p, 100mbps, 1080p, 200mbps, and 4K at 100mbps, 25p. Video quality, as you would expect, is very good, with the camera providing an almost excessive range of options and features. However, this should make it an almost irresistible camera for those heavily interested in high quality video recording, and for those who want to start recording 4K video content, this is an excellent choice. The Panasonic Lumix GH4 is priced at £1299 body only, making it one of the cheapest digital cameras available that can record 4K video. 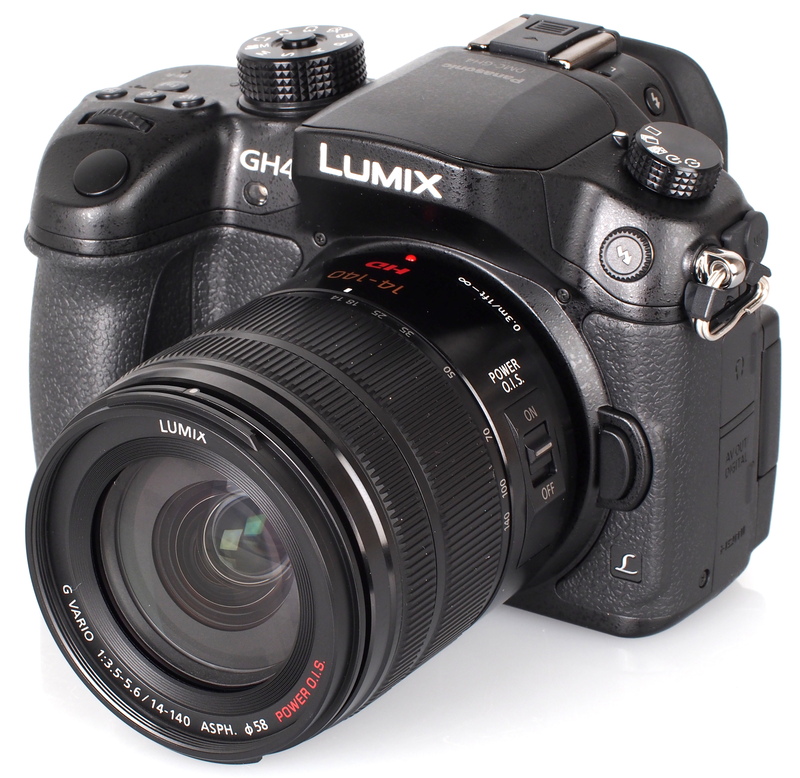 The GH4 is available as a kit with the 14-140mm f/3.5-5.6 lens, priced at £1749. Alternative high speed Digital SLR cameras, include the Sony Alpha A77 which shoots at 12fps from £650 body only, or there is the Canon EOS 1D X shooting JPEGs at 14fps priced from £4500. For video, the only other option for 4K video in a stills camera, is the Sony Alpha A7s, which is not yet available and features a 12 megapixel full-frame sensor. Dedicated 4K video cameras, such as the BlackMagic Design Production Camera 4K, are likely to set you back around £2270 including VAT body only. The Panasonic Lumix GH4 introduces a completely new, cutting edge technology, namely 4K video recording. This is at a price point less than the RRP of the previous model, and is priced without it seeming like it's been marked up at all, despite being one of the first cameras to offer 4K as well as stills photography. As part of the Micro Four Thirds system, the GH4 is perfectly suited to take advantage of the excellent range of lenses available, from both Panasonic and others. Although it would have been nice to see the inclusion of in-camera image stabilisation, as featured in the Panasonic Lumix GX7. The camera also shoots at an impressive 12fps, quicker than the nearest competition, with continuous AF shooting at up to 7.5fps as well. Image quality of both stills and video is impressive, with the camera delivering very good noise performance, as well as pleasing colour reproduction, and numerous options to keep the professional photographer and videographer extremely happy. In fact we'd go so far as to say that this is a videographers dream camera, with more settings, controls and options than ever before seen on a digital camera like this. The GH4 feels great in the hand with a well designed weather-sealed body, along with a large number of customisable buttons, both externally on the camera body, as well as on the touch screen. The layout of the controls and dials are an improvement over the tried and trusted GH3, and for those that want extended battery life, the optional weather-sealed battery grip is available. This would make an excellent choice for those that want high image quality, but want a DSLR styled camera, with the improved (electronic) viewfinder making the camera enjoyable to use in a variety of conditions. Box Contents Battery Charger (AC Cable included), Battery Pack, Body Cap, Hot Shoe Cover, USB Connection Cable, Shoulder Strap, DVD/Lens Cap*, Lens Hood*, Lens Rear Cap* *Included with DMC-GH4A kit and DMC-GH4H kit.